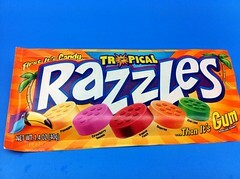 I dig me some Razzles. First it’s candy, then after you crunch them into submission, they meld into gum. Nice. Now there are TROPICAL Razzles. Kiwi-Lime, Pineapple, Strawberry-Banana, Tangerine, and Tropical Punch. These flavors are just as bold and tasty as the original. Mixing and matching them creates some seriously unique treats to the ol’ taste buds. By the end of the bag I had a big-fat-wad of suicide-gum.